You could say that The Jolt were Scottland's answer to The Jam. But really that would be like answering a question that hadn't been fully asked since the two bands share remarkably similar timelines. The Jolt came together in Glasgow in 1976, started gigging in 1977, quickly became label mates of The Jam at Polydor and released their debut LP in 1978. Originally touted as a punk band, it was obvious in listening to their sixties styled power pop that they were much more than that. They were a full blown mod revival band with ringing power chords, crashing guitars and all the angst you might expect. 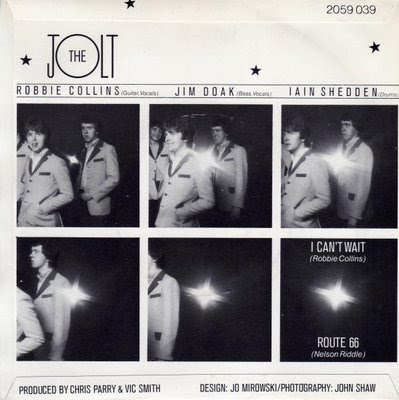 Heavily influenced by The Who, the single here, "I Can't Wait", was their third, and best. Their album is quite good with lots of original material and a couple of top notch covers. Unfortunately, by 1980 just as the mod revival was really getting going the band had disintegrated with members ending up in other up and coming mod groups like Small Hours.